This enigmatic stone was retrieved from the small town of Silves in the Algarve region of southern Portugal by British researcher and author Peter Daughtrey. The scholar believes there is a strong connection between the picturesque hamlet and the fabled continent of Atlantis, a connection he explores in his latest book, Atlantis and the Silver City. 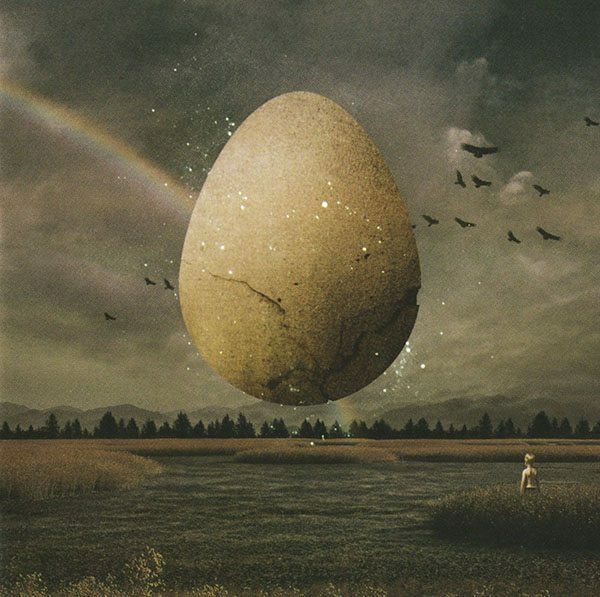 In his book, he describes the unusual stone as being a one of a kind artifact: “a huge stone that is about six feet long, approximately 7,000 years old and with a strong resemblance to a cosmic egg of creation.” But the most outstanding feature of this ancient monument isn’t its size or shape. 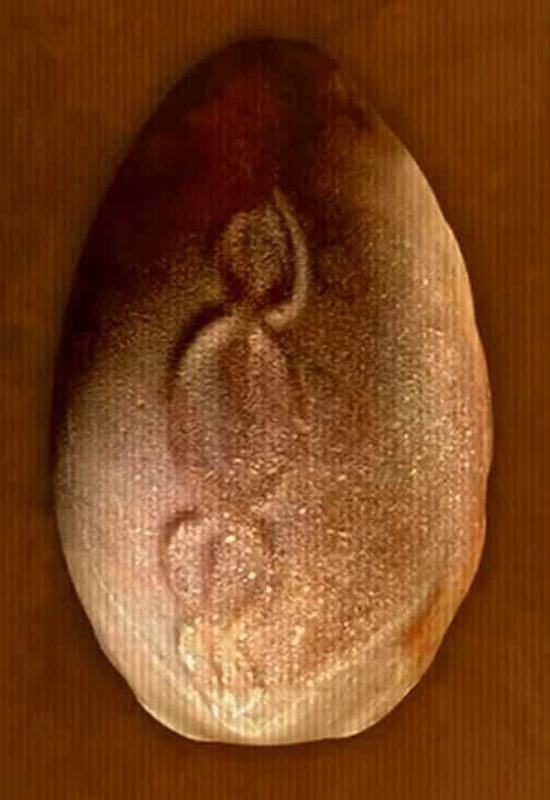 The strange symbol embossed on its surface is what convinced alternative history researchers that this egg has been carrying a hidden message that was overlooked by mainstream science. The scientific community of the 20th century had no way of understanding this message prior to 1953. Although DNA was first isolated by Swiss physician Friedrich Miescher in 1869, it would take another eight and a half decades before James Watson and Francis Crick would discover that the molecule takes on the form of a double helix. Archaeological finds have shown that the double spiral is an artistic motif routinely found on a variety of ancient artifacts. Sometimes it is represented as two snakes wrapping around each other or a common stalk, like in the case of Hermes’s staff, known as a caduceus, meaning herald’s staff. What boggles the mind is the fact that modern science refuses to make the connection between this archaic symbol and the stuff that makes us who we are –DNA. 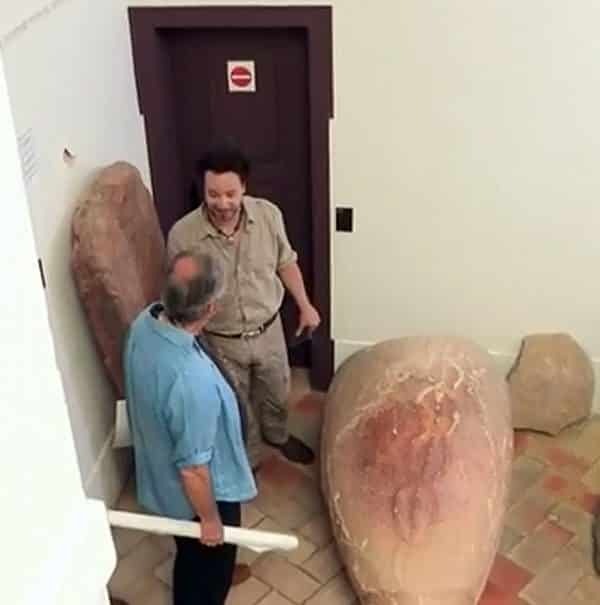 The cosmic egg discovered in Portugal now rests at the Lagos Museum in Algarve and while it makes for a controversial artifact, it is by far the only one of its kind. The cosmic egg is a common occurrence in the mythology of many cultures spanning different epochs and continents. The association between an egg and the universe is a natural one. The egg symbolizes beginning and creation and it only took one step to assume these values to the world around us. The stone eggs of creation were a way through which ancient cultures explained and registered their creation myths for posterity. They were found in Europe, on the territories once occupied by ancient Egypt, and all the way to the far East. Chinese mythology tells the story of Pangu, the first living being and creator of all things. In the beginning, the myth goes, there was nothing but chaos. The primordial disarray then coalesced into a cosmic egg. Within it the principles of Yin and Yang became balanced and out of that equilibrium Pangu emerged and began creating the world. 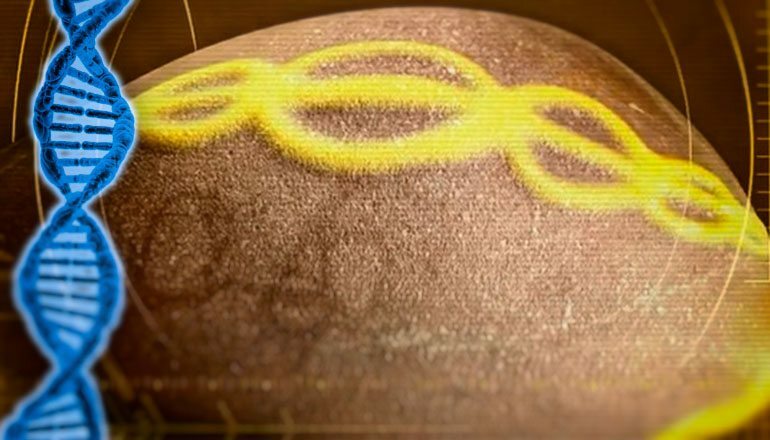 Going even further back in time, we find that one of the earliest depictions of the cosmic egg occurred in ancient Mesopotamia, the birthplace of the Sumerian culture. Coincidence? Lagos Museum curators have classified the enigmatic stone as an ancient menhir (a term derived from the ancient Breton words maen – stone and hir – long). Menhirs or standing stones have been found all over the world, with most of them being discovered in Western Europe. Most researchers agree they are remnants from prehistoric times, left behind by a mysterious megalithic culture. This begs the question: where did these enigmatic people get information about our microscopic architecture, at a time when writing hadn’t been developed yet? Why does the double helix symbol appear in so many different places? Is this the result of fortuitous artistic development or disputed proof of external intervention and knowledge being imparted by an advanced culture? Daughtrey is convinced this is no coincidence or the result of artistic expression falling down on convergent designs. Furthermore, he believes the proximity of Silves to the Strait of Gibraltar and the Pillars of Hercules might warrant a possible connection to Atlantis. In all truthfulness, if there ever was an ancient civilization that possessed the power to peek inside a cell’s nucleus, the Atlanteans would be a safe bet. Next ArticleCERN's AWAKE Experiment Accused of Opening a Stargate and Causing Earthquakes. ConCERNed?